Purpose: This exploratory grant was a design study to develop professional learning activities (e.g. 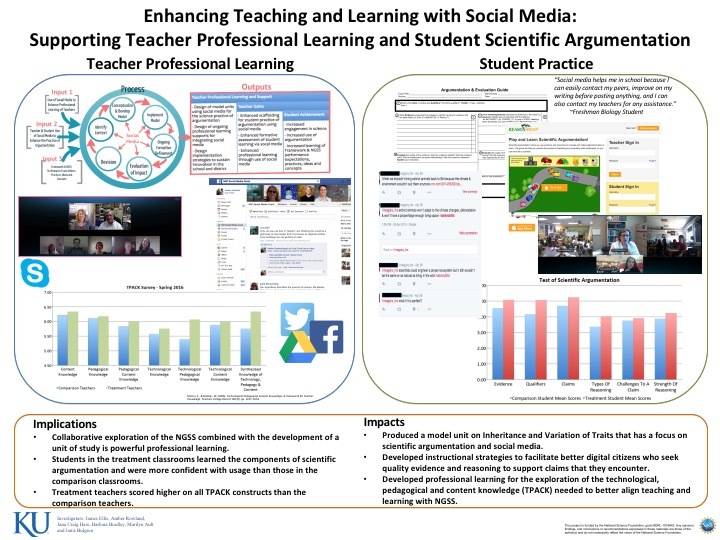 face-to-face, online) to help teachers use available and emerging social media to teach scientific argumentation. A research team of freshman and sophomore (grades 9-10) Life Science teachers collaborating as co-researchers with project staff investigated how particular social media (e.g. Twitter, Edmodo, Facebook, Wikis, blogs, etc.) facilitated scientific argumentation. Second, the team assembled strategies, tools and on-line materials to support teachers’ development of the pedagogical, content, and technological knowledge needed to integrate these emerging technologies into science instruction (Mishra & Kohler, 2006). Theoretical Framework: The theoretical framework guiding this study included research in argumentation, social learning theory, computer-supported argumentation, and social media. The theoretical perspective that learning can be socially constructed through conversation, or dialogue, is well founded (NRC, 2012a; Prestridge, 2009; Vygotsky, 1978). Argumentation is a type of dialogue that involves a group of equal participants, or learners, engaged in the social construction of knowledge specifically by addressing evidence and reasoning to consider or advance a claim (Duschl & Osborne, 2002; Osborne, Simon, Christodoulou, Howell‐Richardson, & Richardson, 2013; Toulmin, 2003). Argumentation is a cross-curricular skill that is highlighted across the CCSS and the NGSS and it is difficult to both teach and learn (Alozie, Moje, & Krajcik, 2010; Bulgren & Ellis, 2010). Research Methods: A mixed-methods pilot study was conducted to compare the treatment classrooms to three comparison classrooms to determine how scientific argumentation was being practiced and how social media was being used. Students in the treatment classrooms experienced the unit developed through this project with the teachers who participated in grant professional learning activities, while the comparison classrooms taught Inheritance and Variation of Traits, business-as-usual. Quantitative data (surveys and test of argumentation) and qualitative data (observations, focus groups, and interviews) were captured for teachers and students. Results: Approximately 400 students participated in the pilot study during the 2015-16 school year, approximately 180 in the treatment and 220 in the comparison group. Overall on the test of scientific argumentation, the treatment group (m = 27.52) scored significantly higher (p = 0.00) overall than the comparison group (m = 24.41) on this measure (See Table 1a). For the teachers (n = 6) the treatment group considers social media to be more valuable professionally and as a tool for student use than the comparison teachers (See Table 1b). Discussion: This study found the use of social media for professional learning to be highly productive and successful. Teachers used FaceBook to plan lessons, problem solve instructional issues and dialogue about areas of concern or struggle. They also used the space to share resources, propose new ideas and grapple with content. Social media served as a safe community for collaborative learning, while also allowing for one-to-one mentoring through individual messaging, especially when a teacher was feeling behind or overwhelmed and really needed encouragement and guidance from a specific member of the team.